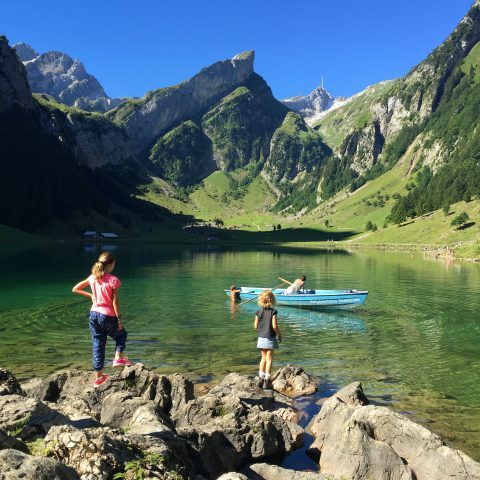 I spent the past two days hiking in the Swiss Alps with my kids and our friends from London. I took the above photo right outside the mountain ‘hotel’ we stayed in, sleeping in a bunk. We grilled sausages on sticks and swam in the icy alpine lake. The beauty of Switzerland is absolutely breathtaking. Why do we humans have such a hard time seeing and appreciating what’s right in front of us? Did I really have to move to NYC to now appreciate and see this beauty? @ Tina the Lovely: unplug. do not post your kids your whereabouts your trip. Keep it to yourself. let yourself go away from us. Agreed. I did not fully appreciate where I grew up (the mountains of colorado) until I moved away to sunny and deserty southern california. My heart aches for the mountains and trees and green scenery.